I might not be coming home. 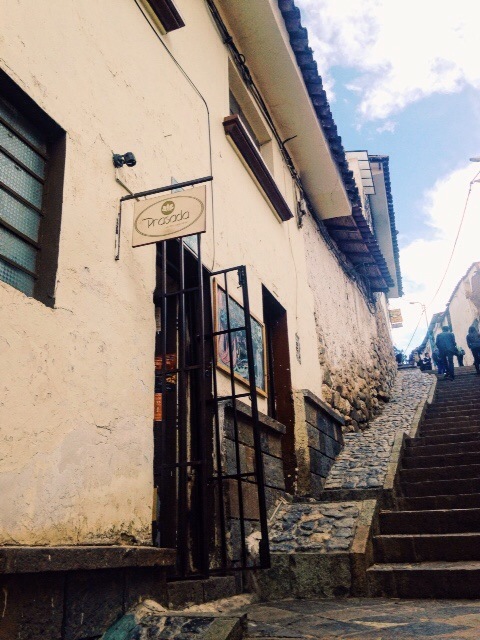 I want to live in the San Blas neighborhood of Cusco. Sorry America. It’s too beautiful here. Tiny little streets with the mountains always in the background. And, as an added bonus, Cusco WINS for vegetarian/vegan food in Peru. I feel like I’m being fed again instead of subsisting on veggie sandwiches! Girl, Stir-Fried is a happy and full chica right now. We have been hanging out in Cusco for a few days now. Not doing a whole lot – mostly wandering around the markets and plazas and eating and taking long siestas as we get used to the altitude. Every time you turn the corner here you want to take more photos, because it’s so scenic as the city stretches up the mountains. I totally see why people skip Lima now. It doesn’t compare. Anyway today I ventured a little further up the hill to San Blas. 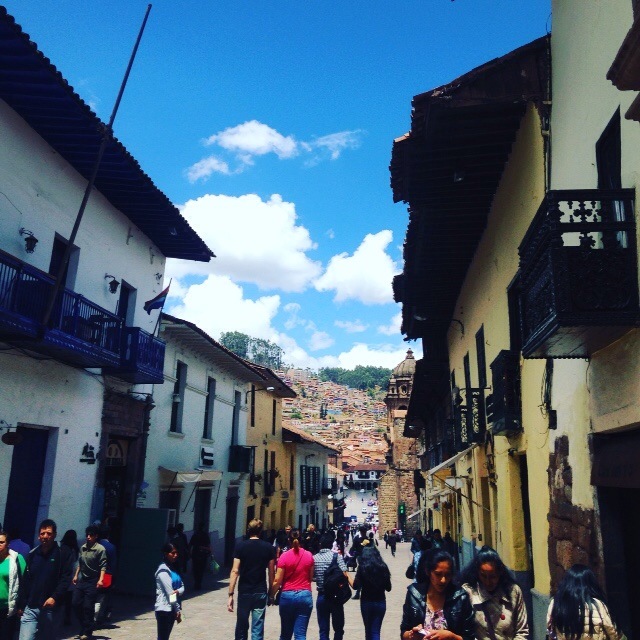 This is known as the “bohemian” neighborhood of Cusco. Not sure about that, but it is the coolest neighborhood I’ve been to so far. The streets are tiny and lined with little cafés and shops and art galleries. As an added bonus, there aren’t people on the streets constantly trying to sell you stuff like in the more touristy parts. It was a nice relief. I went into a couple little vintage shops – resisted buying anything – go ahead and clap, it was an accomplishment – and into a couple bookstores, where I did buy a book, so never mind that thing about not spending money. In my defense, I had just finished the one I brought with me so I technically needed one. And she gave me a free chocolate with it, so it was a steal if you ask me. Anyway it was all downhill from there and since then I’ve been a big spender. Throwing money around. Weeeeeee! I had looked up a veggie cafe beforehand for lunch (gotta be prepared, you know) and just happened to see it on the street. It was called Prasada. Man it was good. I got the veggie tacos and they were HUGE but nice and light, not heavy and filling. The guacamole here is really creamy and good. It’s not a vegan restaurant, but I just got the tacos “sin queso” and that made it vegan. They have full vegan options too and lots of veggie burger options. Accompanied with a ginger tea (didn’t skimp on the ginger root, either) and I was a happy gal. Y’all should definitely check it out if you ever visit. You’ll probably find me there. 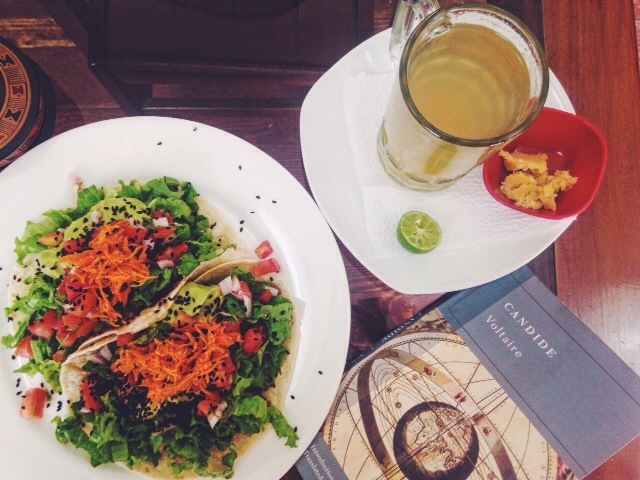 The point is – Cusco, in addition to being all around lovely, is like a little vegetarian heaven in South America. More of my gushing to come, since we are thinking of staying around here a few extra days before continuing south. So zen right now. Previous Post Girl, Stir-Fried Update: Traveling Until Further Notice!